You may now say: "Why do I need this script? I already have a backup function in my hosting control panel (Cpanel, Plesk etc.)". Yes, you have. But the backup functions of the hosting control panels I know, are not so flexible as our "Backup My Webspace" Software. With Cpanel you cannot schedule and automatically run your backups through a cron job. With our PHP Script you can easily do this. I think this is the most important function of a webspace backup software. If you need to run your backup manually, you will run it once per month, only once per year or just when you think about it. If you now lose all your valuable possibly customized website files and you don't have a current backup of it, they will be lost forever. Just imagine, that you had put a lot of money and time into your website. That would be very awful!!! You may now say: "Why should I lose all my website files? And when I lose it, my hosting provider will have a current backup of all my webspace files." First of all, there are many reasons why you can lose your website files. A hacking attack or even when your hosting provider updates some server software, there is risk of losing data. Both scenarios are already happend to some of our customers. Secondly, most providers promise you to regularly backup your webspace files, but when it comes to the worst case they do not guarantee you, to restore your data. This also happend to one of our customers. So due to my experience, the best way to protect you from data loss, is to regularly backup your webspace files by yourself. The only tool you need for it is the "Backup My Webspace" PHP Script. Furthermore this software gives you the option, which is not supported by most hosting control panel backup functions, to backup only parts of your webspace. So for example if you have a website, where your users can upload pictures or avatars, the content of this pictures or avatars directory will change more often then your other files. Now you can create a profile to backup only the pictures or avatars directory and can run it daily, while the profile which backups all your other fils only need to run weekly for example. This will save hosting space and resourses. 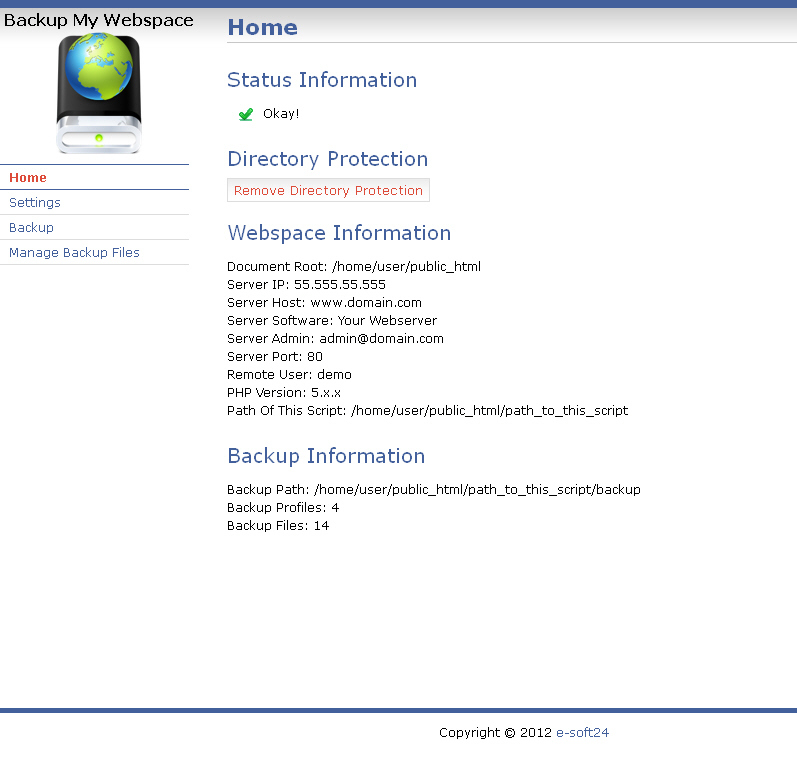 With the "Backup My Webspace" you can also set the number of latest backup copies to keep on your local space. So this script has many more functions than the usual hosting control panel backup functions and can save you a lot of money and time, when the worst case of data loss should happen. Furthermore the script does not need a mysql database and it is very easy to install. Simply upload it to your hosting space, open it in a browser and the script will guide you through the setup process. "Backup My Webspace" is a must have for every website owner. - Backup your entire or only parts of your web hosting space. - Setup unlimited backup profiles and run it automatically through a cron job. - Choose from 4 backup methods (zip, tar, tar.gz and tar.bz2 - if available on your server). - Let the script automatically upload the backup file to an external ftp server after each backup (if available on your server). - Option to automatically remove the local file after successful ftp upload. - Setup the number of backup files to keep. - Manage your backup profiles. - Edit your backup profiles, without the need to modify the existing cron job of this profile. - Download or delete your backup files. - No mysql database required. - Hand coded script, designed under the newest security aspects. - Very easy installation and setup process. Please note: With a single domain license, you can make backups of all domains located at the same webhosting account, as long as it is not restricted (by php open_basedir or safe_mode or whatever) by your hosting provider (on shared hosting for example). The domain license affects only the domain where you run the script. So if you have domains on different shared hosting accounts and you would like to backup all accounts, you need to purchase two single domain licenses or even the five or unlimited domain license. Please note many functions are disabled in the demo.